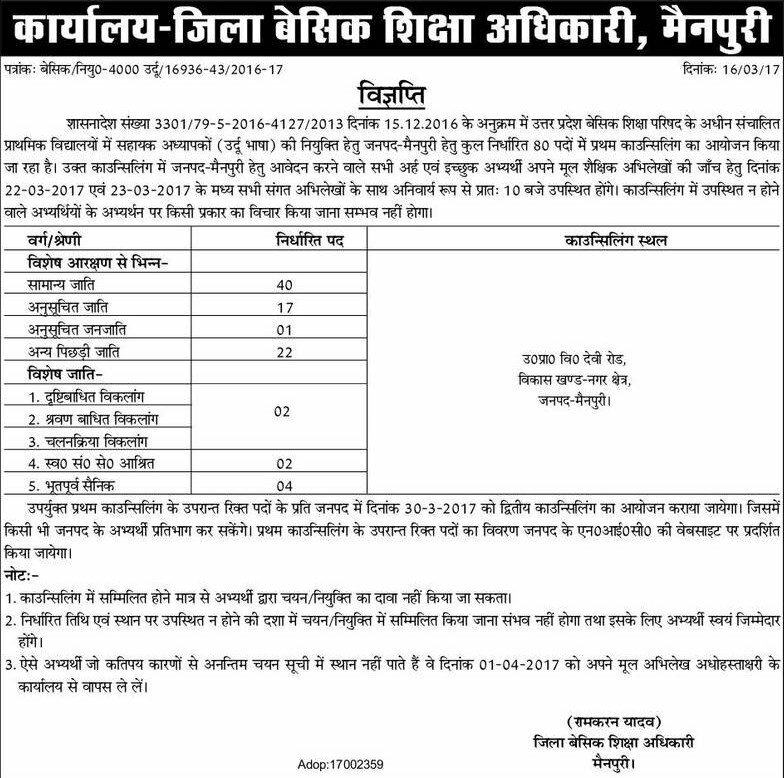 UP Govt is going to fill 4000 posts of Urdu Teacher. 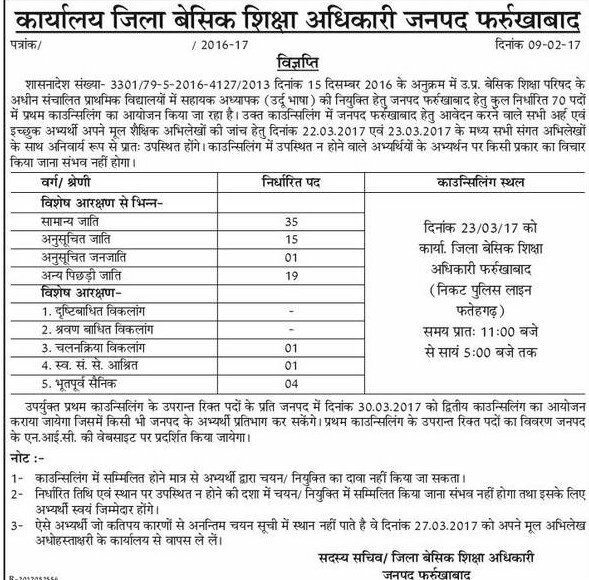 The dates for 1st & 2nd counseling had been declared through vigyapti. 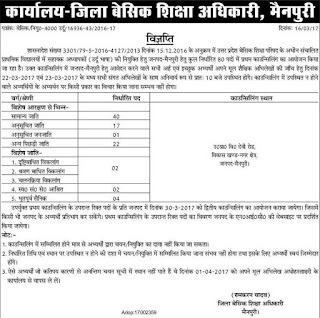 UP Basic Education Department had issued a notification for 4000 Assistant Teacher (A.T.) (Urdu) posts to be filled in Primary Schools of Uttar Pradesh State. 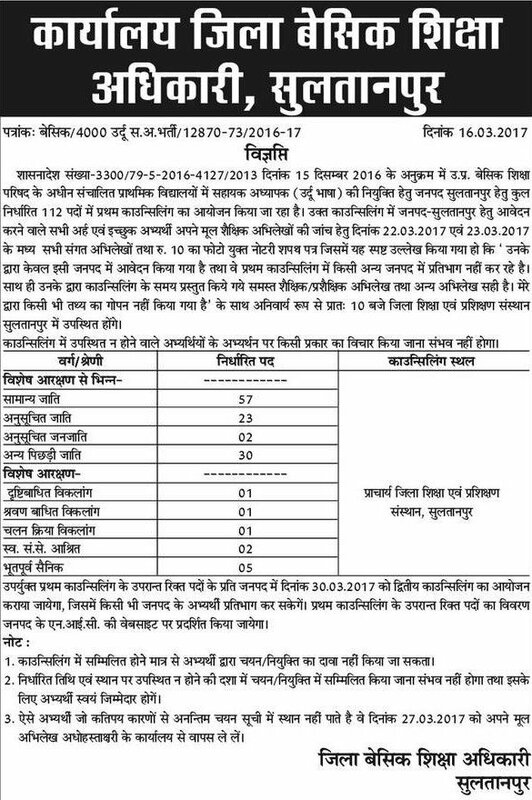 Now counselling is going to be held as a part of the selection process. 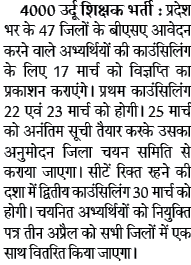 The Bharti process is likely to be completed up to April 2017. 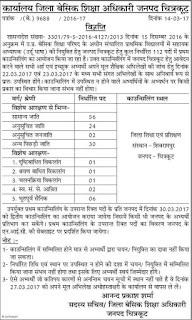 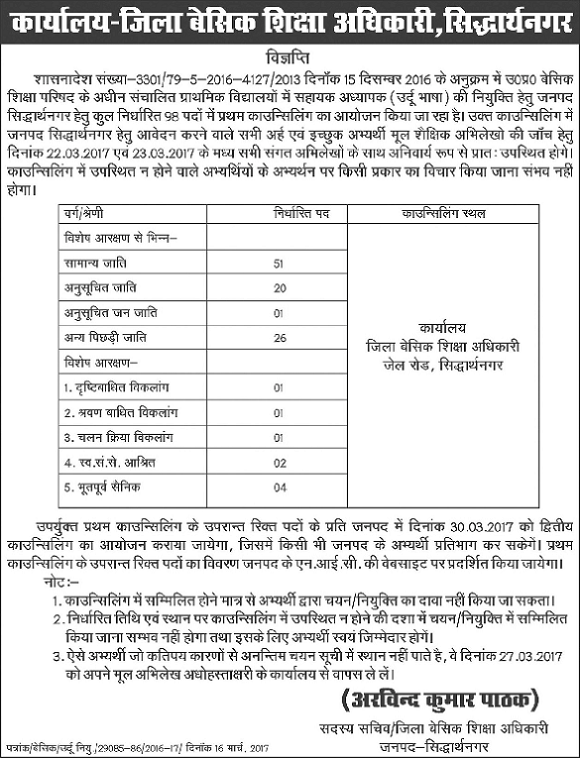 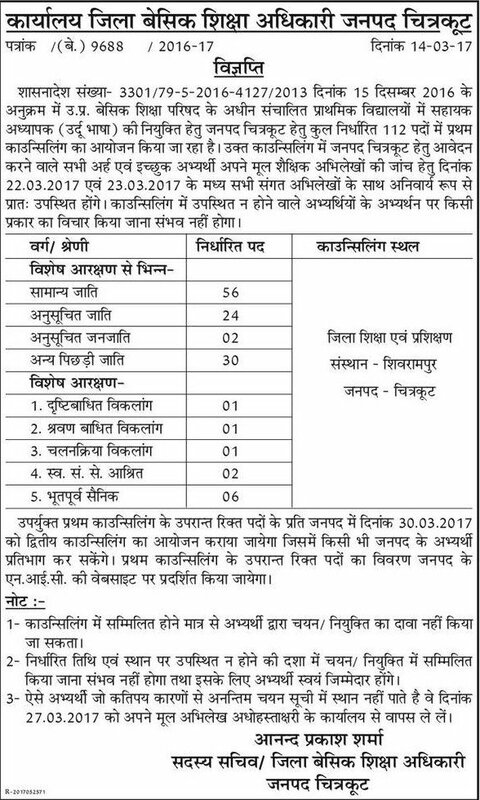 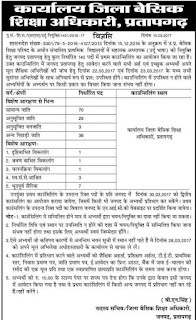 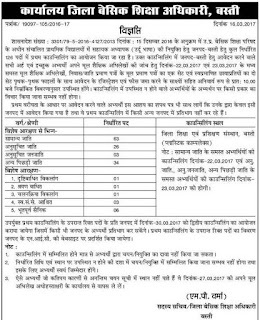 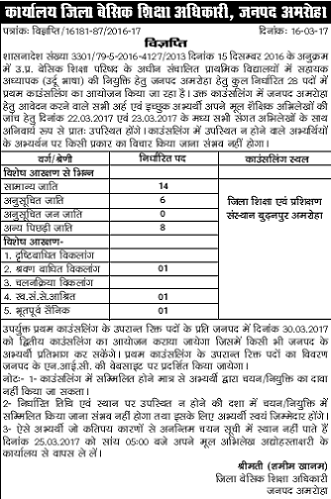 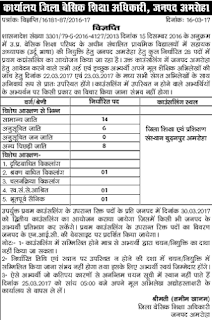 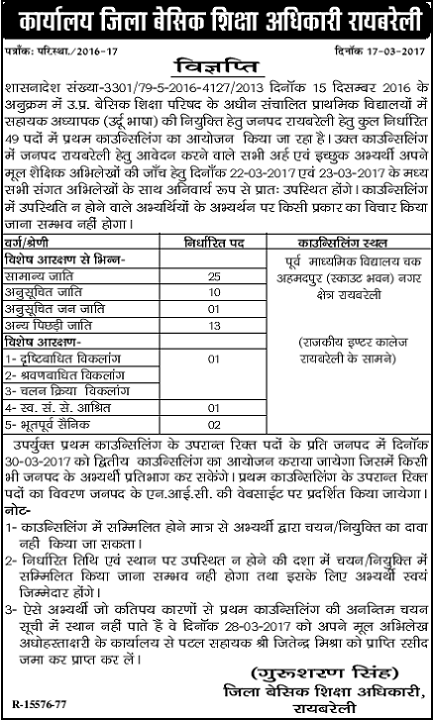 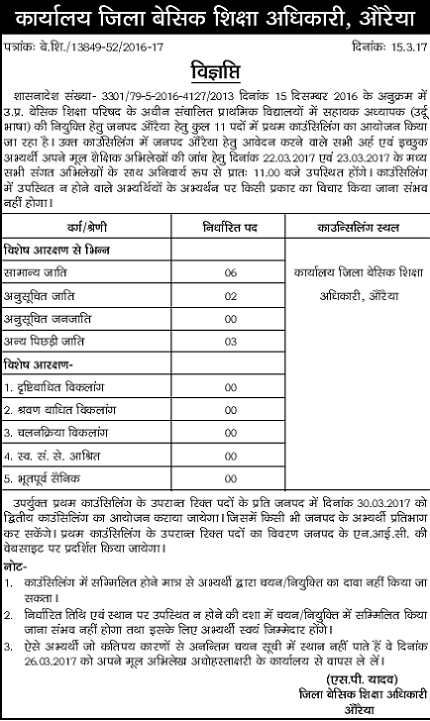 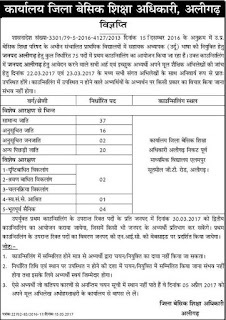 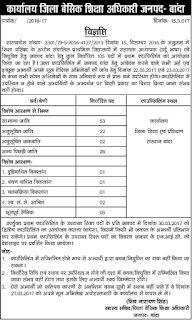 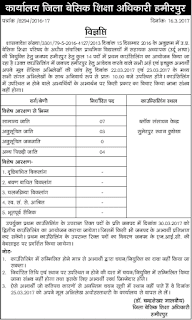 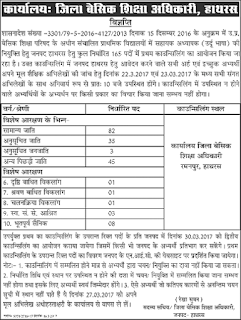 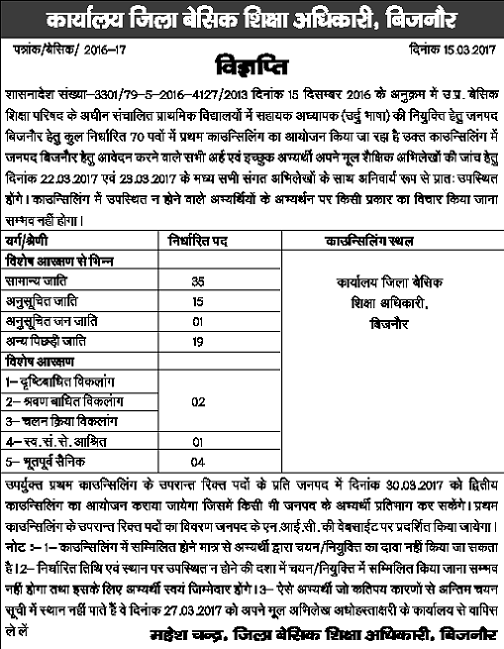 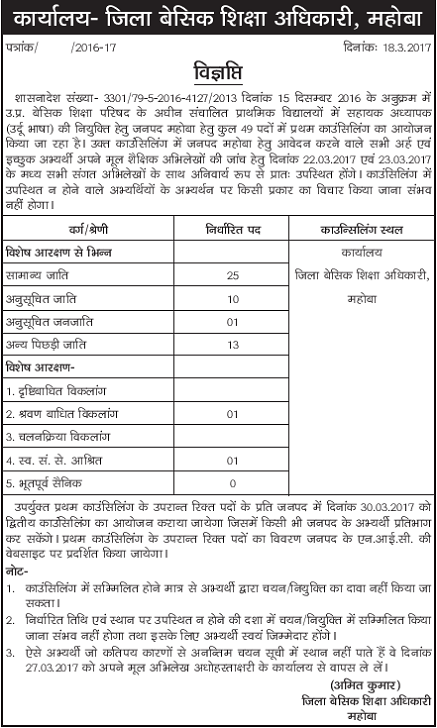 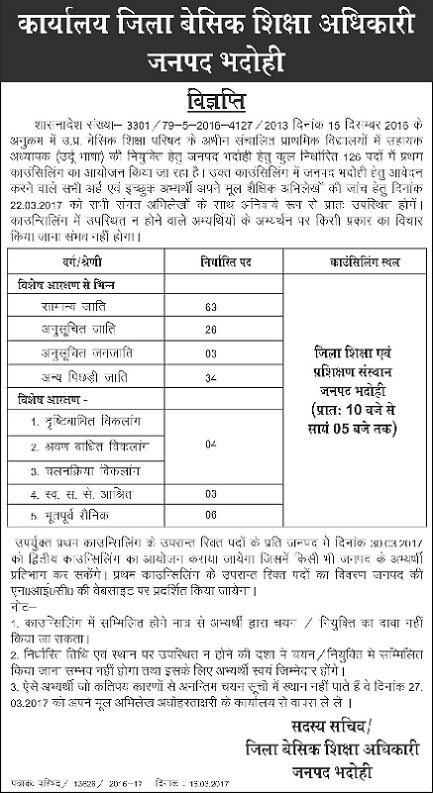 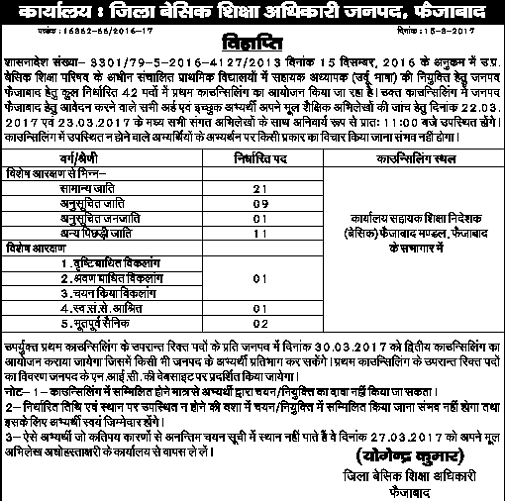 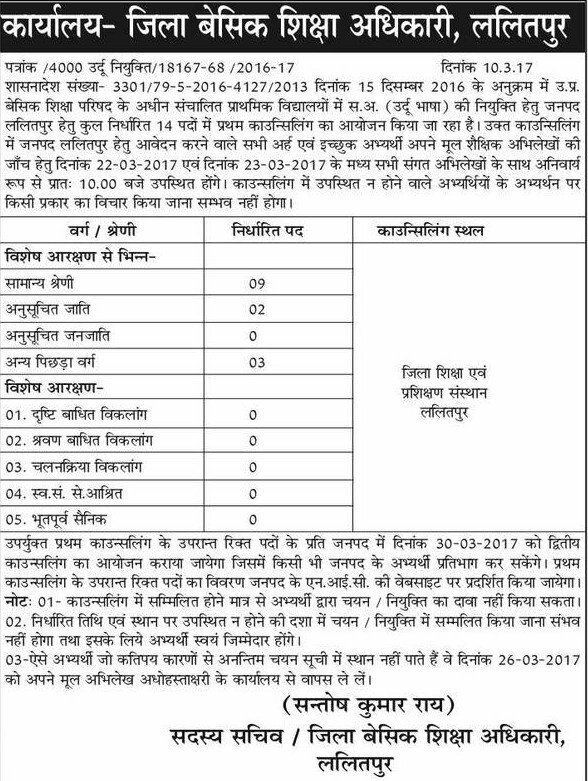 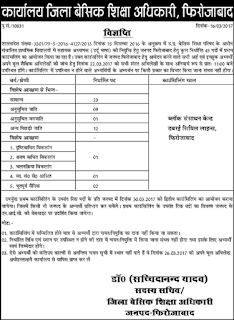 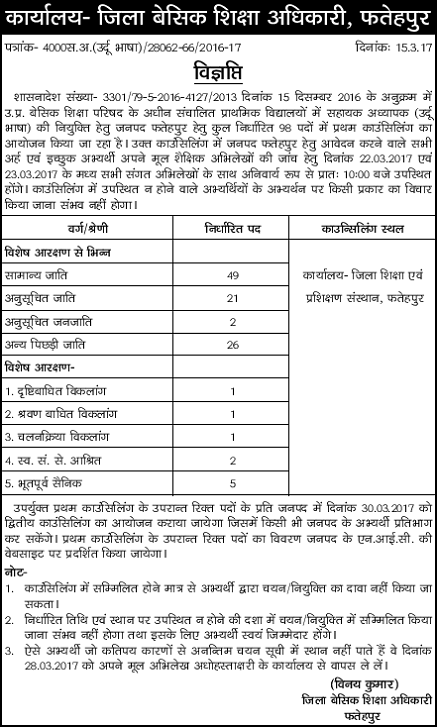 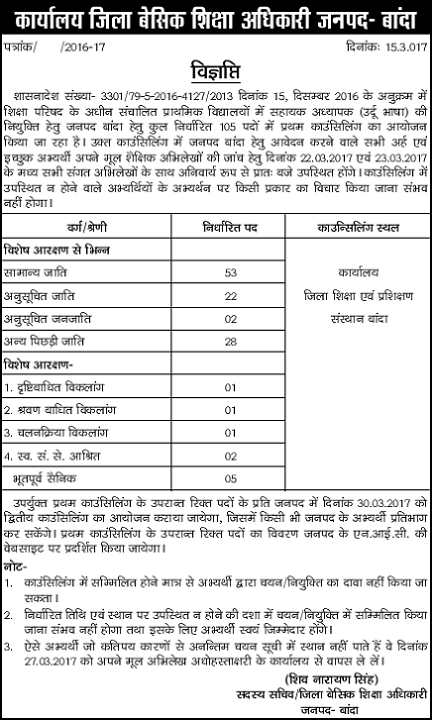 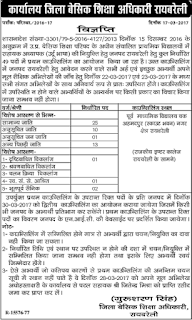 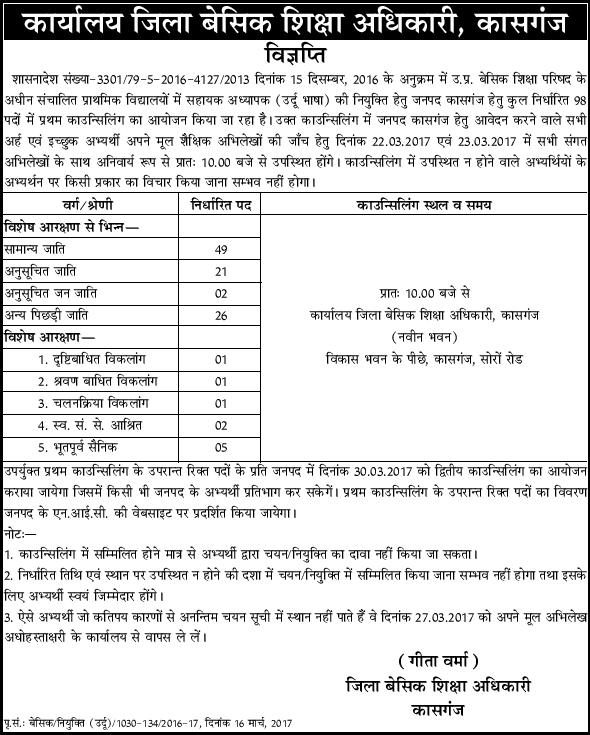 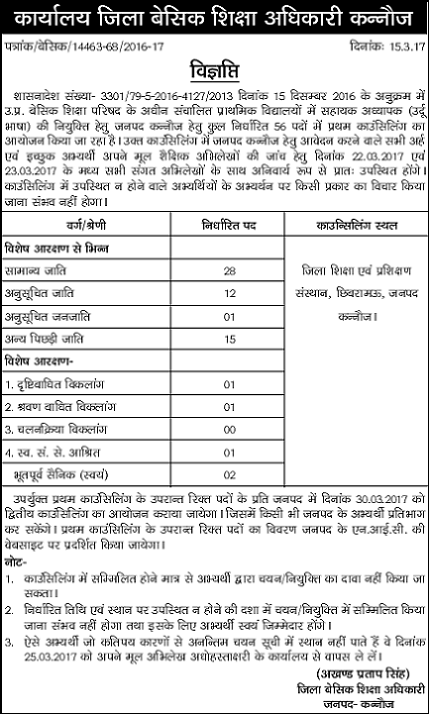 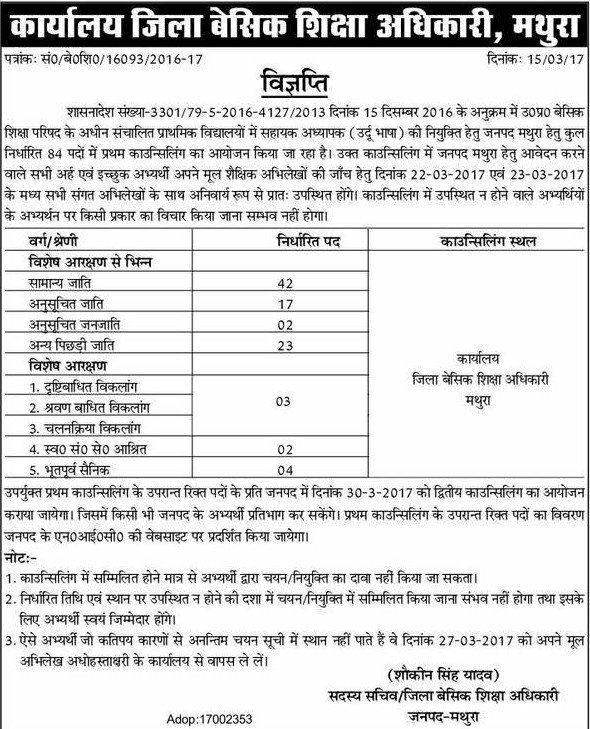 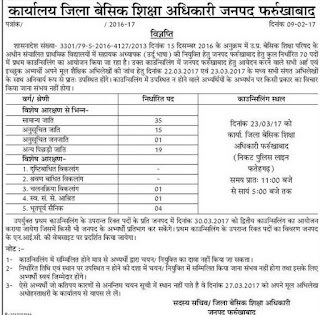 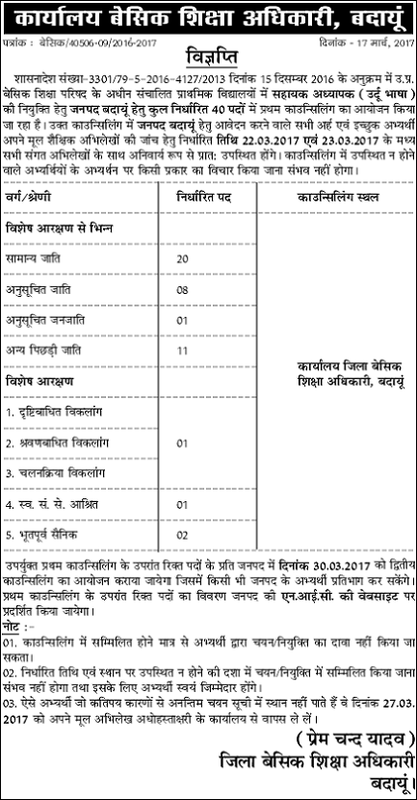 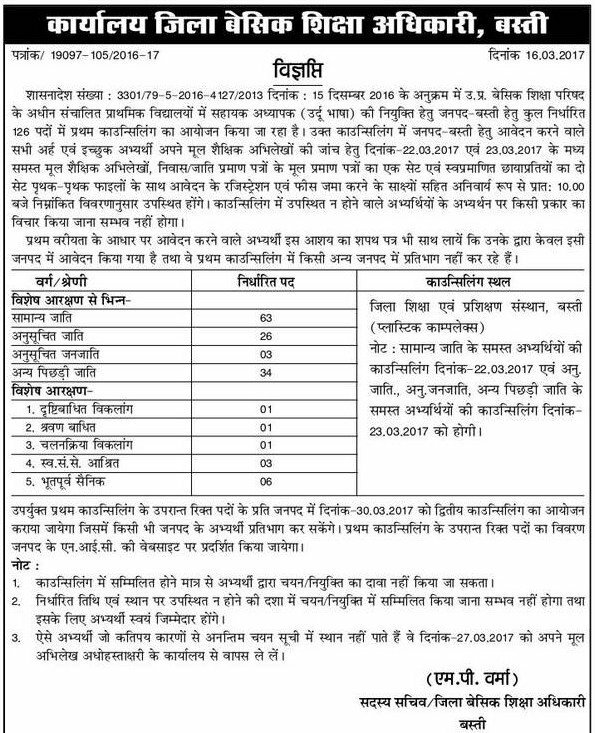 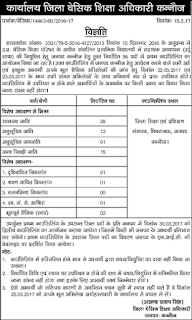 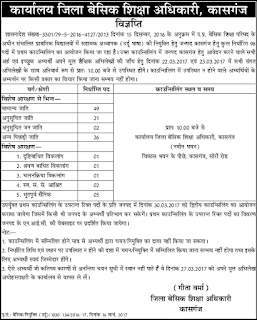 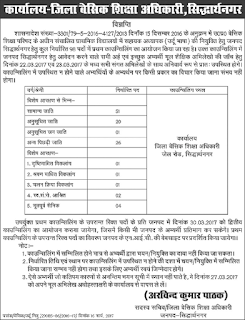 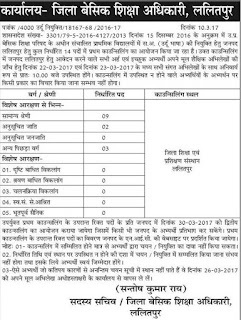 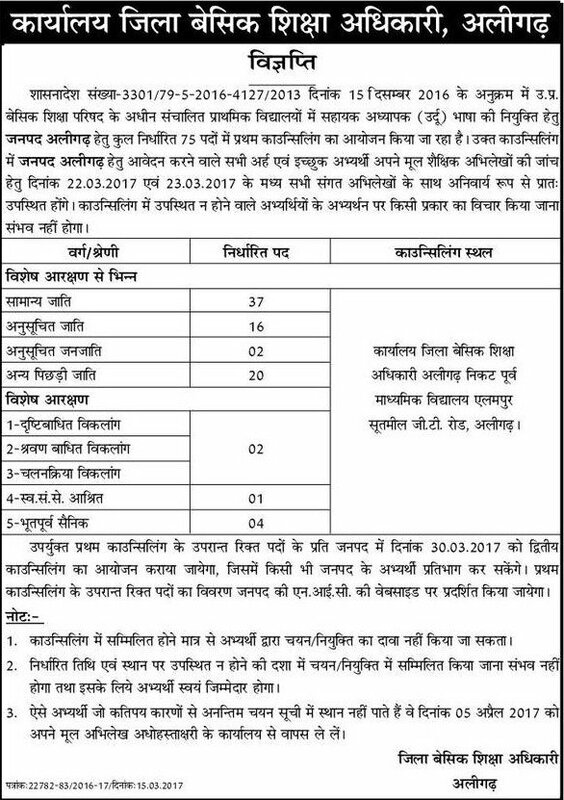 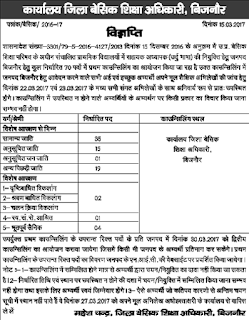 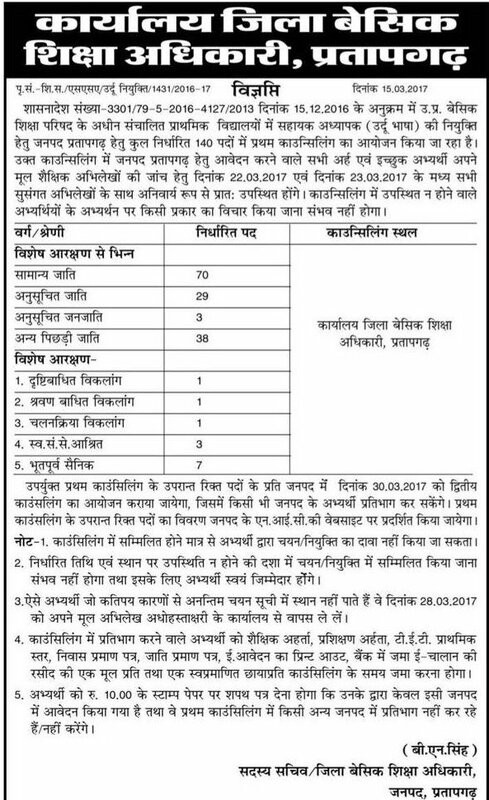 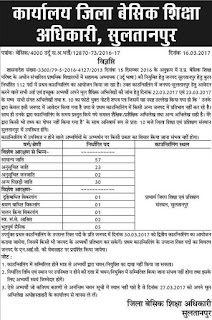 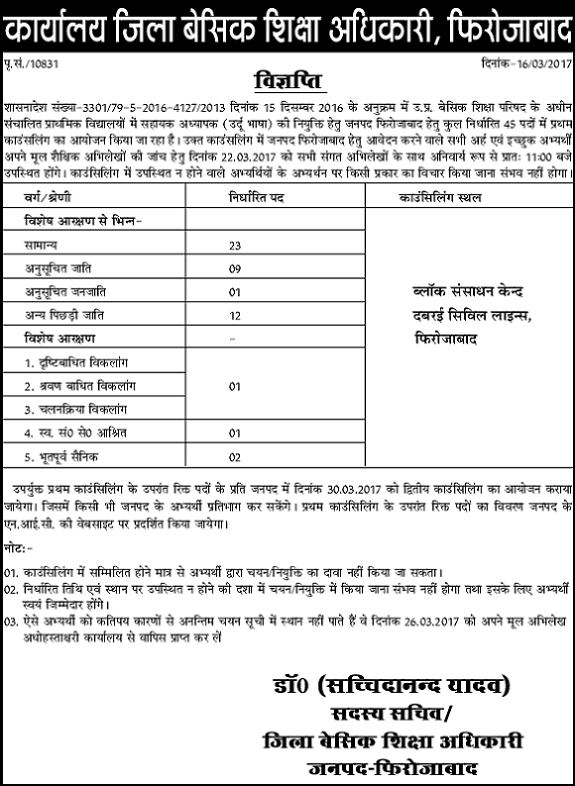 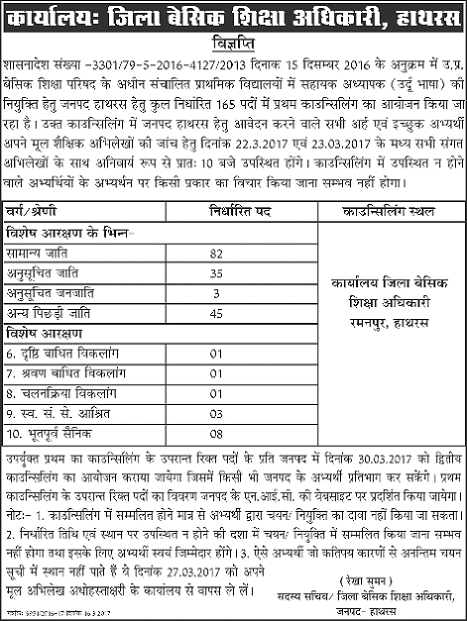 UP Urdu Teacher 1st counselling date : 22, 23 March 2017. 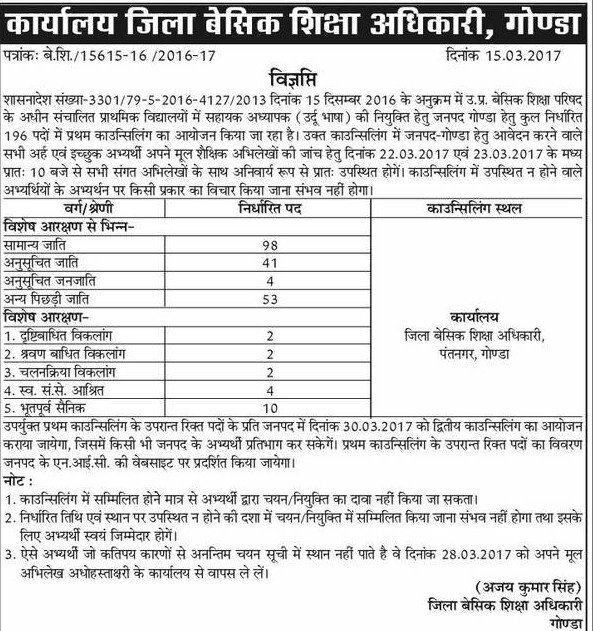 If seate remained vacant, then 2nd counselling may be held on 30.02.2017. 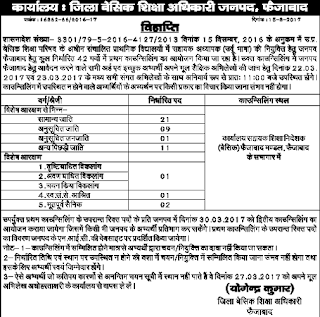 We are going to update you as soon as there is any latest news on UP Urdu Teacher Bharti. 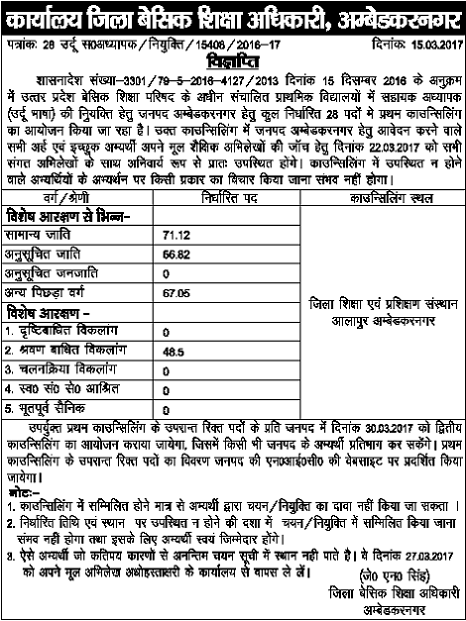 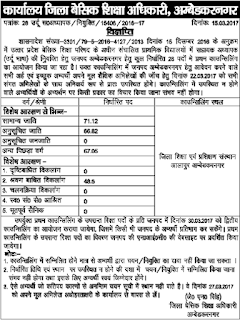 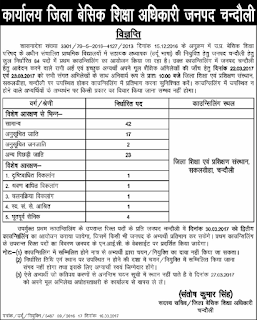 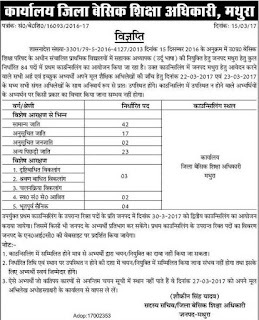 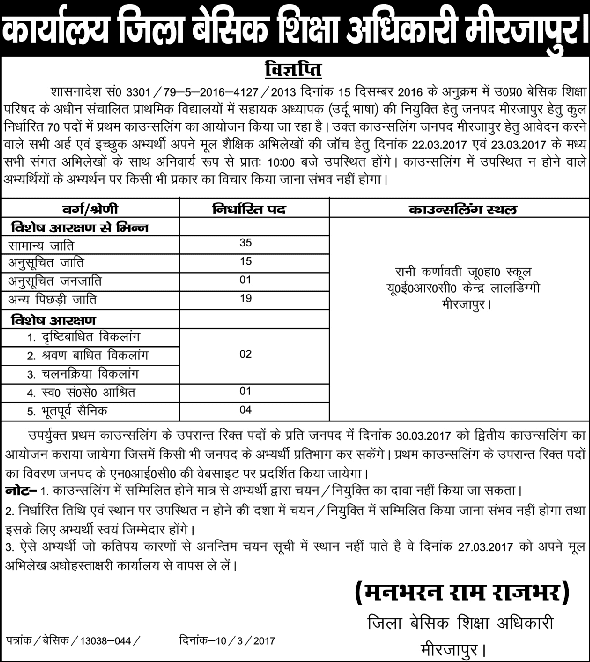 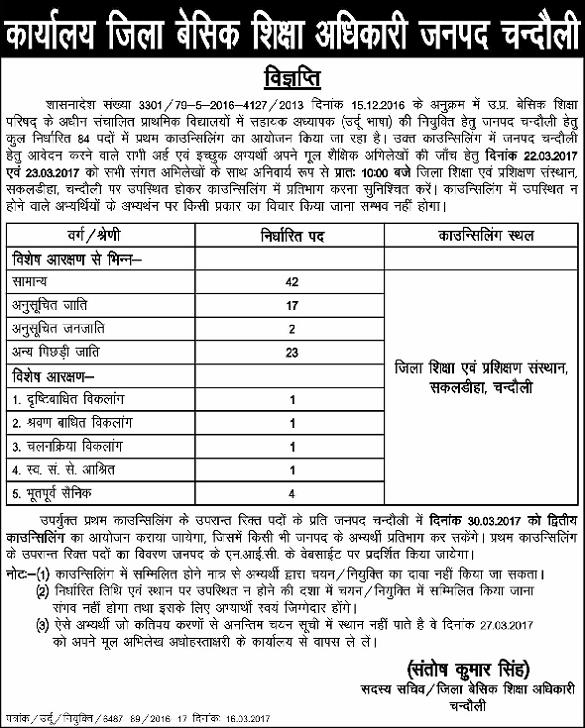 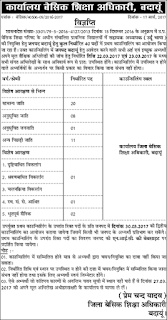 The detailed Advertisement of this bharti had been released by various districts.You can check the vigyapti and district-wise vacancy from below.The Total No. 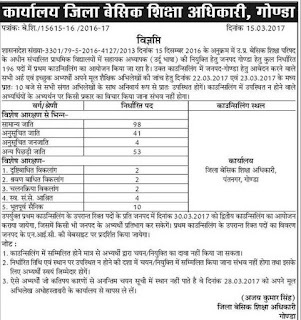 of Vacancies are 4000. 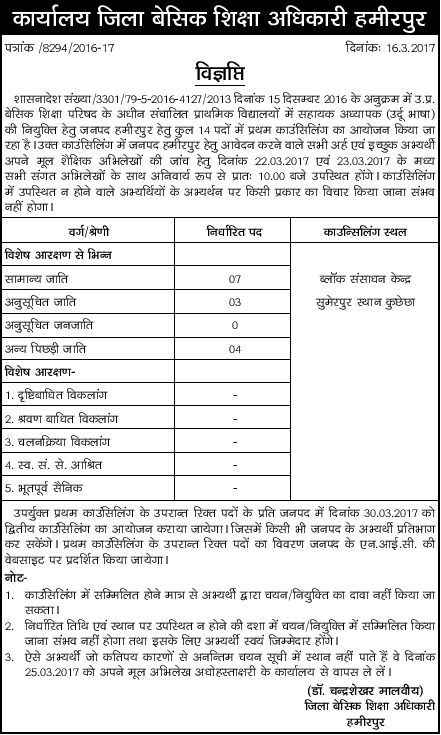 Joining / Appointment - 03 April 2017. The application forms will be filled through Online mode. 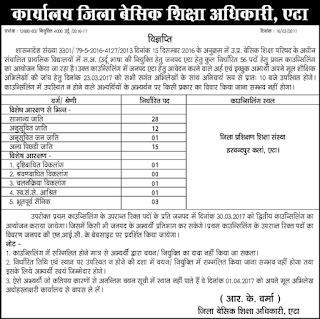 Interested and Eligible candidates can apply online. 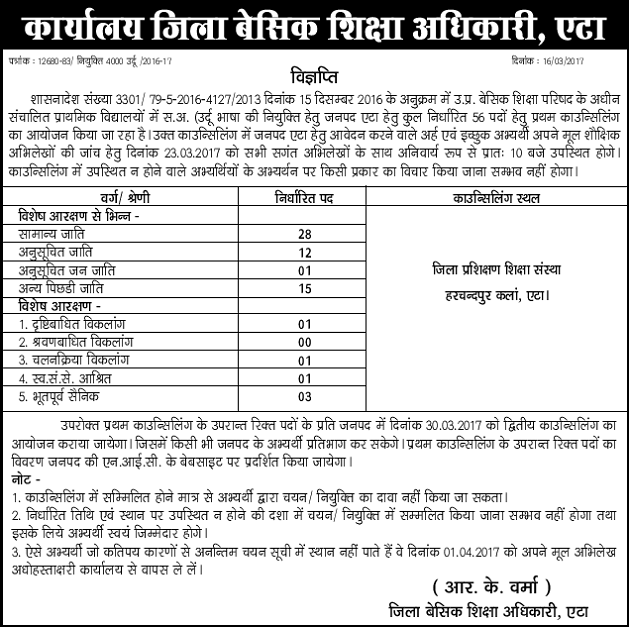 Educational Qualification, Age Limit, Examination Fee will be notified after the release of notification. 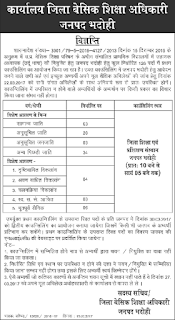 Selection Process: Candidates selection would be done through merit list, counselling. 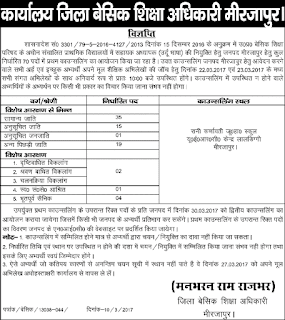 More details and the link to apply online will be updated here after the release of bharti advertisement.